Probably the most common complaint people have in respect to back pain is lower back pain. The lower back area is the central region for all our bending and twisting movements and so it is no surprise that this area ends up in pain when muscle problems in the rest of the body come to a head. Lower back pain is a fairly simple problem to get rid of providing the right approach is taken but unfortunately many people struggle with it because the treatment they seek doesn’t deal with the real cause of the low back pain. Treating the area that feels the pain will not fix this problem because 99% of low back pain problems are referred from other muscles in the body. It is worth remembering this so that if the therapist you see only treats the local pain area, you can save some time and money by moving onto someone else. There are a few areas that people get low back pain, either in the middle of the joint where the sacrum meets the lower vertebrae or to one side or another on the bone where the erector muscle meets the pelvis. Others experience pain right across the low back area on the beltline. All of these different low back pains are the result of pressure building up because core muscles are not supporting the weight of the person properly and the area where the pain is felt is being put under too much strain. If the core muscle function is corrected then the pain can disappear very quickly. 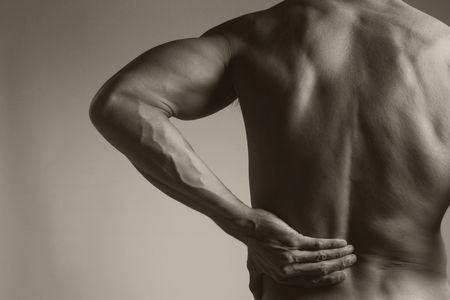 Stretching and exercises for low back pain is not very helpful in most cases, and when it does help, it is generally just masking the problem rather than fixing the cause. The reason these treatments don’t help is because they don’t adequately address the real cause of the low back pain, rather they attempt to loosen or strengthen the area where the pain is felt. If muscles that have become dysfunctional are treated and improved so they can contract and release properly as they are designed to do, the pressure comes off the low back and the pain goes away very quickly. Getting treatment for low back pain should be a straight forward process but it is made more complicated by the approach many therapists take. For example how many people you have seen for low back pain who have done detailed work on your legs? Many types of low back pain go hand in hand with a tilted or twisted pelvis which in turn is set up by imbalances in the muscles in the legs. The muscles in one leg pull the pelvis down or forward sending the whole structure askew. If work is not done on the legs to release this pulling, the pressure never comes off the low back. Any treatment for lower back pain must involve the whole body including the legs to rebalance the pelvis. The treatment must be supported by exercises that help loosen and lengthen the muscles, without irritating them and making them tighten further. To get started watch the FREE video showing you a great technique for getting fast relief from your back pain at home click here. Are explained on this site and covered in more detail in the Back Pain & Sciatica Self Treatment Program. Start here.